Wood burls grow as deformities on a tree trunk or branch that has suffered particular stress. Although their natural appearance is not particularly attractive, when cut for use in large sculpting, woodturning or furniture projects, they reveal an incredible variety of texture in the grain that produces stunning results. 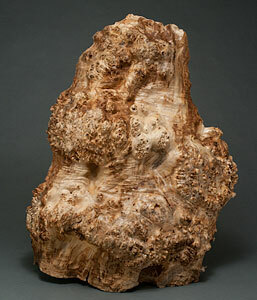 Burls often grow in large sizes, several feet in length, which makes them ideal for creating large-scale unique works of art. They can serve as the basis for a variety of sculpting or other woodcraft projects. Our selection of burl wood and root balls have magnificent texture, color and figure. Our selection of custom pieces are some of the finest to be found, and we have hand-selected some of our best pieces for your projects. "If you love wood; the feel, the smell of wood, as I do, Susan and Les can relate... they will find exactly what you need for your special project." One popular use of burls is to carefully plane, sand and finish them to create a beautifully-textured surface that can be used as a coffee table or other decor item. In doing this, retaining the naturally rough, unkempt edges of the burl wood in your finished piece of furniture will display eye-catching contours and really show off the uniqueness of the wood. The figured patterns and bold colors found in the grain of burl wood are unlike any other wood design, which makes them highly-prized for showing off fine craftsmanship. These attributes are so valued that an entire industry has been built around producing artificial "look-alike" wood burl veneer. But, of course, the texture and intensity of natural wood coloration are far superior to veneer alternatives. Because the pigment of maple wood burls is light in color compared to most other wood species, you have many options for finishing your wood pieces. Whether you prefer to to maintain the natural tone of the wood, or use a darker stain or oil, or apply lacquer for a more highly polished appearance, is completely up to you. Enjoy browsing the burl wood we have available, and please don't hesitate to contact us with any questions or to request additional photos!